The Taito-ku Film Commission has established a tie up with “Tokyo Location Box”, a wide-scale Film Commission that supports all location filming in the whole Tokyo area, to help promote the services being offered by Taito-ku. 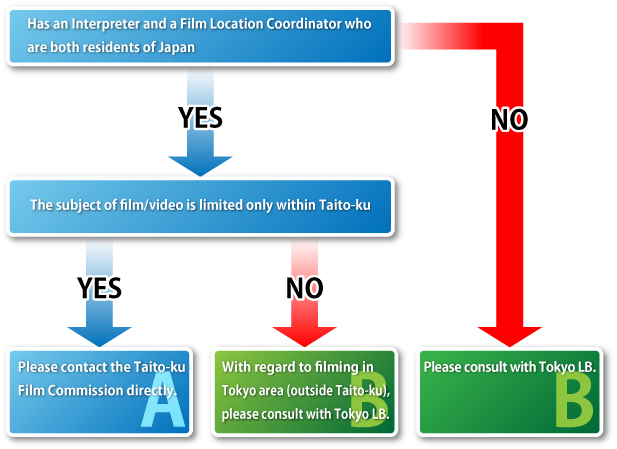 For those who wish to avail of the film support services being offered by Taito-ku FC, please apply by seeking the assistance of a professional co-producer, a location coordinator and an interpreter, who are all residents of Japan. This system is intended to ensure trouble-free communication that may arise from differences in each country’s filming methods and language. Copyright ©2016 台東区フィルム・コミッション All rights Reserved.